Enhance your home’s scent story with Air Wick life scents sweet lavender days scented oil. 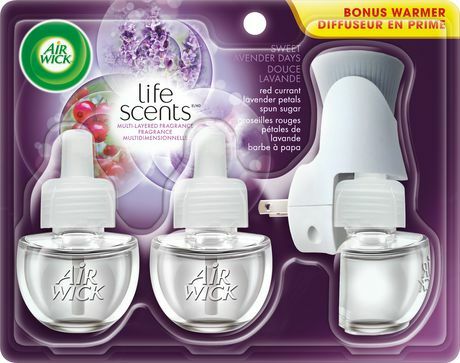 AIR WICK® life scents sollection is the first constantly changing fragrance to create a welcoming atmosphere in your home. Each Air Wick® refill provides up to 45 days* of continuously diffused and carefully blended fragrance throughout your home, office, or any space. Air Wick® Scented Oil Warmers also allow you to control the fragrance level as desired, while enhancing your décor with a sleek look. *Based on low setting.